Hand positioning for post-stroke patients, thumb in full opposition, wrist in 30° dorsiflexion, and MP joints at approximately 80°. Made of adjustable thermoplastic. 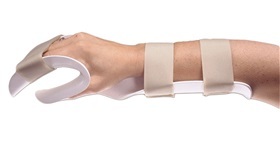 Choose the traditional splint with strap kit included, or select the splint that comes with a comfort-enhancing AliFleece™ Liner. Includes wrist straps that secure in a figure-eight for firm, comfortable hold.